We make it easy to repair your crawl space vent cover by providing a free inspection and estimate. 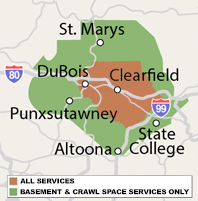 As Greater Clearfield's trusted crawl space expert, we serve Saint Marys, Bellefonte, Altoona, State College, Du Bois and the surrounding area. The better answer for crawl space repair is a vapor barrier system. Call or e-mail Bowman Masonry & Waterproofing for a free crawl space quote!